Editor | Kelsey Overby Creative Director | Sarah Evans Managing Editor | Victoria Gordon Special Thanks to Joey Cheng and Taylor Hemenway. M A K E A P O S I T I V E I M PAC T TO DAY. Photo provided by Resolution Fellows Tahsin Sharif and Wahid Hossain of Oikkyotan. TO S O C I A L R E S P O N S I B I L I T Y.
technologies, it is increasingly possible for entrepreneurially-minded people to build businesses and ventures without traditional infrastructure. In this context, undergraduate students around the world convene in youth conferences, identified as “leaders of tomorrow.” These students have the energy, idealism, and will to solve some of the world’s most persistent problems, but lack the access to capital, training, and ecosystem of support to realize those goals today. With the best of intentions, they hope to make a difference, but senior conference speakers often exhort them to take advantage of the training they receive as “leaders of tomorrow,” implying that their time has not yet arrived. 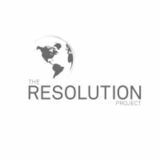 Having managed youth summits themselves, the founders of The Resolution Project saw an opportunity for change and took action. THE BEGINNING In its first few years, Resolution tested methods to activate these young leaders with its first conference partner, Harvard World Model UN (â&#x20AC;&#x153;WorldMUNâ&#x20AC;?). In 2007, Resolution launched an online platform for WorldMUN attendees to connect. In 2008, this evolved into a mini-case competition, through which conference attendees submitted a short essay on a global or local problem, and how they would create an actionable venture to solve it. Resolution received nearly 60 submissions, but the question was: how could Resolution channel this outburst of entrepreneurial spirit? Carlos Garcia and his team present in the first Resolution Social Venture Challenge Finals at WorldMUN 2009 in The Hague, Netherlands. The finalists and judges from Resolutionâ&#x20AC;&#x2122;s first Social Venture Challenge. and optimism, but no obvious pathway to action after the last day of the conference. Resolution co-founders Oliver Libby and George Tsiatis announce the first Resolution Fellows at WorldMUN 2009. Judges from Resolution’s first SVC Final Round pitches, including Advisory Board member Ariel Dora Stern and co-founders Oliver and George. In 2009, Resolution travelled to WorldMUN in The Hague to launch the first Social Venture Challenge (“SVC”). Over 20 teams made it through three online rounds to present their ideas during the Social Venture Forum. Hundreds of their peers streamed through the science-fair-like setting, marveling at these youth-led social ventures. In the Finals, a pitch session with a panel of judges, competitors earnestly presented about the state of their hometowns, the plight of battered women, and the need for technology in rural areas. Five inspiring young leaders were chosen, becoming Resolution’s first class of Resolution Fellows, and launching their proposed Ventures immediately. THE SVCMODEL Having built a strong, proven system in partnership with WorldMUN, Resolution began partnering with more Host Conferences in 2012 to increase its sources of undergraduate student leaders. Because of the scalability and portability of the SVC model, the organization was able to expand its portfolio of Host Conferences rapidly. The SVC also proved to be a compelling proposition for youth conferences, given its ability to extend student impact beyond the final day of the conference and add to the conferencesâ&#x20AC;&#x2122; value proposition to students. Social Venture Challenge Forum at the Youth Assembly at the United Nations in February 2015. Resolution has a proven model for identifying and inspiring young leaders through our SVCs and Fellowships: We collaborate with existing youth conferences. We invite undergraduate students attending these conferences to propose social ventures through the SVC. This is a multi-stage competition, combining web-based submissions, live rounds of presentations, and due diligence. We award Resolution Fellowships to those young leaders with the most compelling personal leadership characteristics and promising social venture proposals. We support our Fellows with dynamic, hands-on mentorship, seed funding, and access to world-class global advisory resources from our dedicated team of volunteers and Guides. The impact of activating potential young leaders through social entrepreneurship is inspiring; they become engaged early in making positive changes in the world and the character of their leadership is infused with social responsibility. Resolutionâ&#x20AC;&#x2122;s current Host Conferences include Harvard WorldMUN, Harvard National Model United Nations, The Youth Assembly at the United Nations, The Clinton Global Initiative University, Semester at Sea, African Leadership Academy, and The Igniting Innovation Summit. tomorrow, but are capable of leading today. Photo of Chelsea Clinton, Vice Chair of the Bill, Hillary, and Chelsea Clinton Foundation with the Social Venture Challenge Winners and the Resolution team at CGI U 2015. 495 student competitors and dozens of Resolution team members. Resolution’s SVC Forum at CGI U 2015. Social Venture Challenge Forum participants at the Youth Assembly at the United Nations in February 2015. OUR FELLOWS Resolutionâ&#x20AC;&#x2122;s mission is to develop socially-responsible young leaders and empower them to make a positive impact today, and its vision is a generation of leaders with a lifelong commitment to social responsibility. Resolution is empowering a global community of Resolution Fellows to begin their lifetime of positive impact earlyâ&#x20AC;&#x201D;as undergraduate studentsâ&#x20AC;&#x201D;while becoming effective and connected leaders for good in the world. they also serve as the crucible for the development of their leadership. Whether Fellows continue with their original ventures or not, these experiences infuse Fellows with social responsibility and effective management skills. Resolution thus creates multiple layers of impact, from social ventures, to successful young leaders, to engaged and inspired volunteers. Even in the few short years of Resolutionâ&#x20AC;&#x2122;s existence, its Fellows have done incredible work and have helped shape communities around the world. The following pages highlight just a few initiatives that our Fellows are actively pursuing, organized by Resolutionâ&#x20AC;&#x2122;s seven core areas of sustainable impact. Photo provided by Resolution Fellow Anderson Lima of Casa de Áak. basic needs Tackling high rates of unemployment and a poor quality of water in Haiti through a simple filtration system. Resolution Fellow Jessica Laporte. Photo courtesy of Resolution Fellow Jessica Laporte of Kouzin Dlo. A participant in Sales Agent training washes her hands before lunch. Participants practice door-to-door outreach using role plays at Sales Agent training. to affordable purification methods for communities across Haiti. Photos courtesy of Resolution Fellow Jessica Laporte of Kouzin Dlo. deaths in children under 5 each year in Haiti. These women are acting as health educators and water purification advocates in communities across Haiti. development Building a business center in Honduras to offer subsistence farmers a way to support themselves and their families while providing entrepreneurship training. Resolution Fellow Antonio Peralta. Photo courtesy of Resolution Fellow Antonio Peralta of El Carrizal Business Center. their likelihood of becoming small business owners. education Connecting high school students in Zimbabwe with mentors to provide counseling services for educational and professional guidance. Resolution Fellows Prince M Abudu and Taku Machirori. Photo courtesy of Resolution Fellows Prince M Abudu and Taku Machirori of Emergination Africa. associated with the college application process. pursue higher education and interesting career paths. energy&environment Promoting energy efficiency, reducing household electricity bills, and changing future generations in India through the switch of a light bulb. Resolution Fellow Mansi Prakash. Photo courtesy of Resolution Fellow Mansi Prakash of Brighter Today. Resolution Fellow Mansi Prakash (left) with community members in India. their incomes on other basic needs, such as education, healthcare, and food. Resolution Fellow Mansi Prakash installing CFL light bulbs to promote energy efficiency and lower energy bills in India. an 11-Watt energy-efficient compact fluorescent bulb uses 80% less energy. PA I N TA S T I C K I D S ! equality&empowerment Using art therapy to heal and help with the emotional development of homeless children in Indonesia. Resolution Fellows Muhammad Hadley Aulia, Rasilia Palmi, and Nuriasani Yukendri. Photo courtesy of Resolution Fellow Muhammed Hadley Aulia, Rasilia Palmi, and Nuriasani Yukendri of Paintastic Kids! Photo courtesy of Resolution Fellows combating societal stigma against children Muhammed Hadley Aulia, Rasilia Palmi, and Nuriasani Yukendri of Paintastic Kids! with disabilities. Photo courtesy of Resolution Fellows Muhammed Hadley Aulia, Rasilia Palmi, and Nuriasani Yukendri of Paintastic Kids! Participants of Paintastic Kids!, an arts education program for street children, natural disaster victims, and ill or disabled children. Resolution Fellows Muhammed Hadley Aulia, Rasilia Palmi, and Nuriasani Yukendri with participants of Paintastic Kids! a source of income and aid to their survival. health&wellness Installing composting toilets and educating locals about sanitation in Honduras to resolve the widespread issue of water pollution and reduce disease. Resolution Fellow Raquel Granados. a single house in La Teja has a toilet and thus, human waste causes water pollution, infecting drinking wells with dangerous levels of the Cryptosporidium bacterium. The community lacks the necessary access to medical assistance, which increases the danger of pollution. Resolution Fellow Raquel Granados is working with locals to fix these issues by building composting toilets and educating the locals on the merits of using them - how composting toilets will be effective, reduce illnesses, and provide economic benefits to the area. Resolution Fellow Raquel Granados (center) with community members building composting toilets in La Teja. She then hopes to scale her Venture to surrounding communities. Raquel and her team installed composting latrines throughout the community, including at the local church and school, to help alleviate many of the problems caused by water pollution and poor sanitation. humanitarian aid Building a career development center in Georgia to help displaced peoples discover their passions through job recruitment, training, and mentorship. Resolution Fellows Mariam Getiashvili and Akaki Gotsiridze. Photo courtesy of Resolution Fellows Mariam Getiashvili and Akaki Gotsiridze. network through career fairs so they can gain employment and finally afford basic needs. their families and results in financial and social pressure. Resolution Fellows Akaki Gotsiridze (left) and Mariam Getiashvili (right) with a member of the team from the Career Development and Job Recruitment Center. to lead not only tomorrow, but today. As Resolution continues to increase its impact through its growing Fellow community and its inspiring Ventures, Resolution will continue to operate with the assurance that leaders of now make better leaders of tomorrow, and that some impact today leads to bigger impact tomorrow. Challenges are threatening to overwhelm the world, and yet Resolutionâ&#x20AC;&#x2122;s hope grows because of the generation of leaders who are starting today and committing their lives to social responsibility. GROWING Photo courtesy of Resolution Fellows Muhammed Hadley Aulia, Rasilia Palmi, and Nuriasani Yukendri of Paintastic Kids! 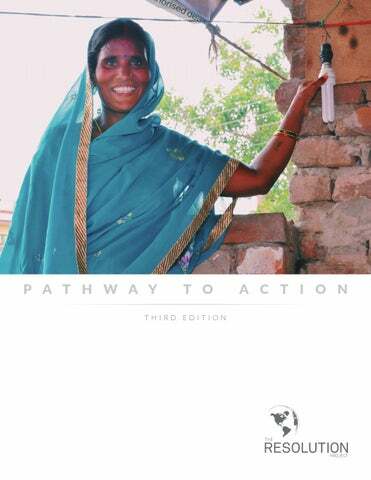 The story of The Resolution Project and our global network of young leaders.